•	Load ranges from 800kg up to 1500kg per wheel. Flanged cast iron wheel with ball bearings. Wheel diameter 100mm,outter flange 125mm, tread width 38mm, bore size 20mm, hub length 50mm. tread ascent 3 degrees relative to the wheel axle with a Load capacity 800kg. Flanged cast iron wheel with ball bearings. Wheel diameter 125mm,outter flange 145mm, tread width 38mm, bore size 20mm, hub length 50mm. tread ascent 3 degrees relative to the wheel axle with a Load capacity 900kg. Flanged cast iron wheel with ball bearings. Wheel diameter 150mm,outter flange 180mm, tread width 38mm, bore size 20mm, hub length 50mm.tread ascent 3 degres relative to the wheel axle with a Load capacity 1000kg. 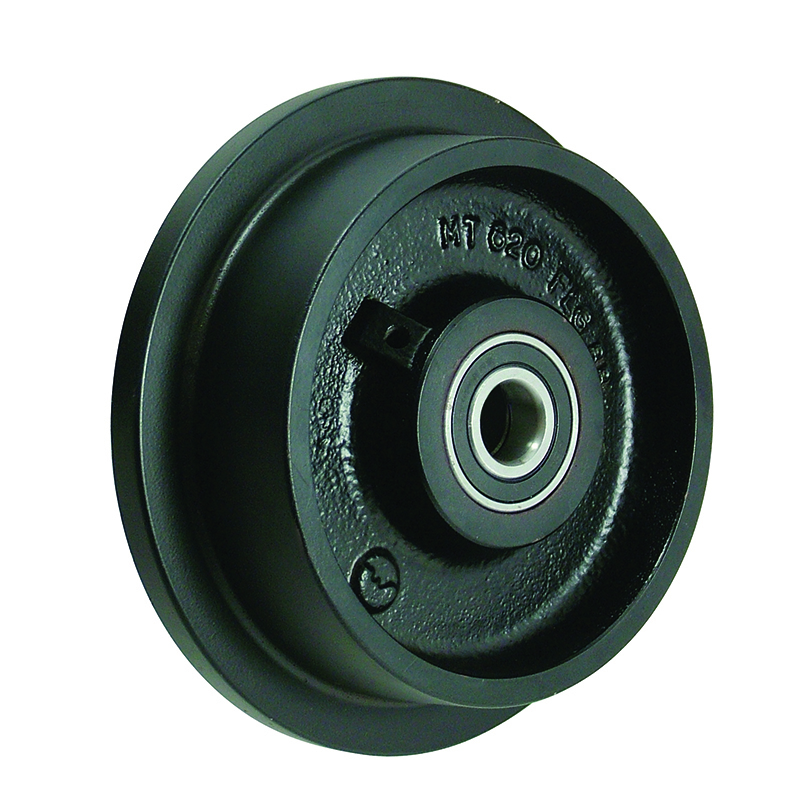 Flanged cast iron wheel with with high temp ball bearings to 270c. Wheel diameter 125mm,outter flange 145mm, tread width 38mm, bore size 20mm, hub length 50mm. tread ascent 3 degres relative to the wheel axle with a Load capacity 900kg. Flanged cast iron wheel with ball bearings. Wheel diameter 200mm,outter flange 230mm, tread width 44mm, bore size 25mm, hub length 58mm. tread ascent 3 degres relative to the wheel axle with a Load capacity 1500kg. Flanged cast iron wheel with ball bearings. Wheel diameter 200mm,outter flange 230mm, tread width 44mm, bore size 20mm, hub length 58mm. tread ascent 3 degres relative to the wheel axle with a Load capacity 1500kg.